Molecular tumor profiling is rapidly driving personalized medicine within oncology. The value of identifying a targetable mutation using next-generation sequencing for available therapies or clinical trials cannot be underestimated. Herein, we review essential considerations in the initial assessment, specialty referral, and sequencing of treatment for advanced prostate cancer with an identified actionable mutation. We present a 71-year-old man with metastatic prostate cancer whose disease progressed after multiple conventional therapies. He was offered molecular tumor testing, which showed the presence of a pathogenic BRCA2 mutation in exon 11 called c.2330dupA (p.Asp777GlufsX11). Further investigation revealed that this mutation was also present in the pathogenic germline. The BRCA2 gene is a tumor-suppressor gene involved in DNA repair; pathogenic mutations in BRCA2 impede protein production and increase cancer risks. Intervention with a PARP inhibitor for compassionate use induced a significant response in a heavily pretreated patient. A 71-year-old German American man with a history of cutaneous melanoma, which was diagnosed at age 64 and treated with wide excision, was initially diagnosed with a clinical stage TIIb prostate adenocarcinoma at age 68. The prostate tumor was bilateral, with a Gleason score of 4+4. At diagnosis, the prostate-specific antigen (PSA) was 1.98 ng/dL, and the nuclear medicine bone scan was without evidence of bony metastases. However, CT of the chest revealed multiple bilateral sub-centimeter pulmonary nodules predominantly in the basilar lobes. A CT-guided biopsy of a left lower lobe lesion was nondiagnostic. A biopsy performed using video-assisted thoracoscopic surgery showed poorly differentiated carcinoma. Immunohistochemical staining was negative for CK5/6, CK7, CK20, p63, TTF-1, PSA, PSAP, and CDX-2, most likely representative of metastatic prostate cancer, upstaging the patient’s prostate carcinoma diagnosis to stage IV. At the time of initial diagnosis, the patient was referred for genetic counseling due to his personal history of melanoma and prostate cancer with Gleason score >7, and his family history of cancer including a brother with prostate cancer diagnosed at age 65; mother with breast cancer diagnosed at age 85; a maternal aunt with postmenopausal breast cancer; and a maternal first cousin who died from lymphoma at age 50. Nonetheless, genetic testing was denied by insurance as the patient’s age at prostate cancer diagnosis was greater than 55. The patient was initially treated with androgen deprivation therapy (ADT) with leuprolide, but he developed hematuria 4 months after treatment from local progression with bladder invasion. Bicalutamide (Casodex) was added and the hematuria improved, although the patient still required self-catheterization for bladder outlet obstruction, which was confirmed with urodynamic testing. One month later, autologous immunotherapy with sipuleucel-T (Provenge) was added to ADT. Soon after the third and final dose, the patient developed fever, which prompted evaluation with a chest x-ray; it revealed disease progression in pulmonary metastases. The patient was initiated on docetaxel, along with ADT. A total of 8 well-tolerated cycles were administered, with the exception of onycholysis of the fingernails. His disease remained stable (Table) and a channel transurethral retrograde prostatectomy (TURP) was performed for palliation. One year after initiation of docetaxel, CT and PET-CT showed progression in the lungs; abiraterone acetate (Zytiga) and prednisone were added to ADT. A restaging PET-CT after 3 months showed a significant increase in the size of innumerable lung metastases, as well as new pelvic osseous lesions and enlargement of the bladder-invading mass. The patient received cabazitaxel (Jevtana) and denosumab (Xgeva). Six months later a mixed response was noted: stable lung findings but modest progression of osseous metastases. The patient required nephrostomy placement for right ureteral obstruction and repeat TURP for sequelae of disease progression. The specimen from the TURP was sent for next-generation sequencing (NGS). Testing identified 3 genomic alterations: c.2330dupA (p.Asp777GlufsX11) in BRCA2, deletions of exon 44-46 in ATR, and a splice site mutation in RB1. Despite cabazitaxel, denosumab, and ADT, the patient rapidly deteriorated with hypoxic respiratory failure. Despite continuous supplemental oxygen via nasal cannulae, the patient suffered with continuous dyspnea and air hunger, failure to thrive, weakness, deconditioning, and lethargy. Although no FDA-approved actionable therapies were available for the ATR and RB1 genomic alterations detected, his BRCA2 alteration carried FDA-approved options in other tumor types. Patients studied across tumor types in clinical trials with olaparib (Lynparza) had an ECOG performance status of 0 or 1. Our patient, for whom we obtained olaparib via petition for compassionate use after rapidly and symptomatically progressing on cabazitaxel, had a declining performance status and was wheelchair-bound, rendered unable to perform virtually any self-care due to profound dyspnea despite being on continuous supplemental oxygen. The patient required assistance with basic activities of daily living, such as bathing and preparing food, and had an ECOG performance status of 4. The patient experienced dramatic improvement in symptoms within a matter of days (detailed further in “Patient Update” section, below). Both clinical and radiographic improvement was observed for 9 months. This patient’s remarkable improvement is unprecedented in the literature (uniquely: poor performance status, extensive visceral involvement, and rapidity of documented objective improvement upon administration of PARP inhibitor). Highly effective targeted therapies, such as imatinib in chronic myelogenous leukemia and the use of tyrosine kinase inhibitors in lung cancers and melanoma harboring mutations in EGFR or BRAF protein, respectively, continue to emerge with the recent wave of drug development. The success of targeting plasma cells in multiple myeloma with daratumumab (Darzalex) or the B-cell maturation antigen antibody– drug conjugate are more recent examples. Precision medicine–based clinical trials will continue to lead toward additional potentially curative therapies. Implementation of targeted therapies gives more options to patients across an expanding diversity of tumor types. It is important to factor in the similarities and differences with the population studied in clinical trials, as well as the expected toxicity, presumed efficacy, ease of administration, and cost. Testing was performed to investigate for somatic DNA-repair deficits. Prostate tissue obtained during a palliative TURP procedure was sent to FoundationOne for genomic testing, an NGS-based assay that identifies genomic alterations within roughly 350 cancer-related genes. The assay revealed a BRCA2 insertion mutation. In addition to the BRCA2 mutation, an alteration was detected in ATR (deletion exons 44-46) and RB1 (splice site 380_380+2>TAGAAATTTAT), but no FDA-approved therapies or potential clinical trials were available for those 2 alterations. Confirmatory germline genetic testing was performed to analyze DNA extracted from a peripheral blood specimen. The DNA hybridization and PCR amplification (TruSeq Custom Amplicon) of both the BRCA1 and BRCA2 genes were completed for sequencing. Potentially pathogenic variants were confirmed using capillary sequencing, multiplex ligation-dependent probe amplification, quantitative polymerase chain reaction, or repeat array comparative genomic hybridization analysis. Of note, due to technical limitations, this testing could not reliably detect mosaicism or chromosomal aberrations. A pathogenic germline mutation was identified as BRCA2 c.2330dupA at the cDNA level, and p.Asp777GlufsX11 (D777EfsX11) at the protein level. The duplication of an adenine at this place changes an aspartic acid to a glutamic acid at codon 777 in exon 11. The exon 11 duplication causes a frameshift and creates a premature stop codon at position 11 of the new reading frame. This mutation is predicted to cause loss of normal protein function through either protein truncation or nonsense-mediated mRNA decay. This mutation has been associated with breast and/or ovarian cancer1 as well as with early-onset prostate cancer,2 confirming the potential pathogenicity of this patient’s mutation. The PARP inhibitor olaparib is approved for treating advanced ovarian cancer with BRCA mutation. The US FDA granted Breakthrough Therapy designation for treatment of BRCA1/2- or ATM-gene–mutated metastatic castration-resistant prostate cancer (mCRPC) in early 2016 after promising study results were published. Olaparib and rucaparib (Rubraca) are inhibitors of PARP, causing inhibition of the base excision repair pathway. This allows for cell death in BRCA-deficient cells by inducing “synthetic lethality” when coupling PARP inhibition with the native DNA repair deficiency derived from BRCA mutation. The patient experienced dramatic improvement in symptoms within days of initiation of therapy with olaparib. Vital signs were monitored daily, with improvement. At his follow-up visit 6 days after beginning olaparib, a marked improvement in his dyspnea with exertion was noted. The patient had regained ability to ascend a flight of stairs. His morphine requirement steadily decreased. During this follow-up visit, the patient reported an improvement in resting heart rate from 130 beats per minute (bpm) pretreatment to 100 bpm by day 4 of treatment with olaparib, although he still remained on 4 liters of oxygen by nasal cannula. Follow-up on the 14th day after treatment initiation was notable for continued improvement. The patient’s supplemental oxygen flow rate had decreased to 2 liters, and his pulse rate had continued to improve to 90 bpm. On day 40, patient denied any dyspnea and had returned to an active lifestyle; oxygen could be removed comfortably for up to 6 hours with a resting pulse-oximetry measure of 94%, improving to 97% with 2 liters of supplemental oxygen. This patient no longer required any morphine for dyspnea. At day 55, supplemental oxygen was discontinued and patient was able to walk more than a mile without symptoms. PSA was continuing to improve to less than 1 (from 4.07 prior to initiation of PARP inhibition; see Table). Chest x-ray and PET-CT scans at 7 weeks showed a partial response. At 9 months, the patient began to experience clinical symptoms and CT scans showed progression. Unfortunately, the patient’s condition deteriorated with renal failure and respiratory compromise that precluded administration of carboplatin, and the patient opted to enroll in hospice care. 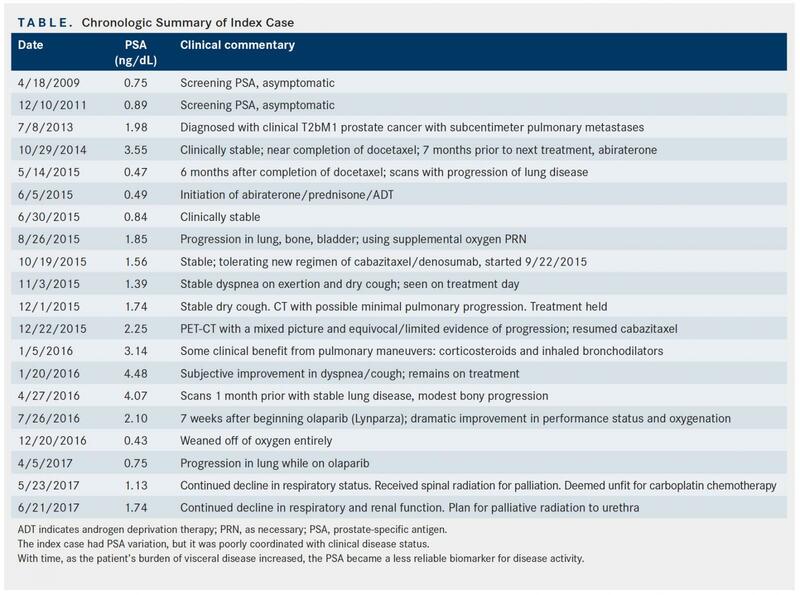 Despite disease progression, the patient’s PSA at the end of life did not escalate accordingly, a discordance that is commonly seen when there is a predominance of visceral disease, as PSA becomes an unreliable biomarker in these patients. The patient’s children were encouraged to meet with a genetic counselor; his son reportedly tested positive for the pathogenic BRCA2 mutation. This case adds important information to recent discoveries in the treatment of prostate cancer with underpinnings of defective DNA-repair genes. Our patient had a non-OCCR BRCA2 alteration (located on exon 11 but at nucleotide 2330, which is not within bounds of the OCCR). Specifically, our index case highlights the use of olaparib in patients with mCRPC who have a DNA-repair gene defect, in a patient with several traits that have not been represented by those studied in the current literature and with outcomes reported herein that have not been reported in the recent landmark studies of PARP inhibition. Importantly, we report therapeutic activity in a patient with poor performance status and with visceral crisis; we note the potential rapidity of attaining an objective and clinically meaningful response with use of PARP inhibition. The index case had a progression-free survival (PFS) of 9 months; it is notable that he derived efficacy comparable with that of the patients studied in the TOPARP trial, where the median PFS observed was 9.8 months12; this is despite his significantly worse ECOG performance status and visceral disease burden as compared with the TOPARP study population. The patients studied in clinical trials had an ECOG performance status of no worse than 2. Our patient (for whom we obtained olaparib out of compassionate use) had a very poor performance status, was wheelchair-bound, and was rendered unable to perform virtually any self-care due to profound dyspnea. To date, studies have not clearly elucidated the rapidity of response to treatment. Fortunately, our patient was recording vital signs daily, and close follow-up afforded a unique insight into the rapidity of the patient’s objective response. The marked improvement in resting pulse and pulse oximetry readings corroborated the marked subjective improvement that he experienced within the first few days of therapy. The importance of this objective response cannot be overstated, as there remains a widely held notion that conventional chemotherapy should be employed in the face of a visceral crisis in order to obtain a response more rapidly, but this is a poorly founded principle, often extrapolated from other cancer subtypes. Recent practice-changing updates in the management of prostate cancer, including upfront use of chemotherapy or combination hormonal therapy with conventional ADT and second-generation ADT such as abiraterone, have improved survival metrics while maintaining quality of life. In addition, we are seeing the flourishing field of precision medicine uncover therapeutic options at a historic rate. It is important to note that DNA damage repair alterations are present in more than 22.7% of patients14 with mCRPC. This is particularly important information in the treatment of prostate cancer, as resistance to primary ADT and the emergence of mCRPC pose therapeutic challenges’ mCRPC itself goes on to develop resistance to the therapeutic agents in our conventional armamentarium. Our index case had an unusual presentation (prostate cancer with visceral metastases to lung and no bony lesions) that raised the suspicion for atypical genetic bedrocks underlying this particular prostate cancer. Carrying a deleterious germline BRCA2 mutation confers a 23-fold relative risk of developing prostate cancer by age 56.15 BRCA2-mutated prostate cancer has a propensity to involve viscera at a much higher rate than does sporadic prostate adenocarcinoma, and it carries a relatively poor prognosis. Olaparib has been approved for the treatment of relapsed or refractory ovarian cancer. More recently, the PARP inhibitor has been shown to be active against mCRPC, an effect that seems more pronounced in patient with driver mutations affecting DNA repair. The importance of personalized medicine and targeted therapy is well documented. This case adds to the understudied population of prostate cancer patients with visceral disease, and to the management of patients with a poor performance status. Using genomic sequencing can identify a driver mutation that might be actionable, with treatments that are tolerable for patients. In addition, a keen understanding of hereditary cancer syndromes and the indications for their workup is important, as it guides selection for NGS and referral for genetics counselling. Oros KK, Ghadirian P, Greenwood CM, et al. Significant proportion of breast and/ or ovarian cancer families of French Canadian descent harbor 1 of 5 BRCA1 and BRCA2 mutations. Int J Cancer. 2004;112(3):411-419. Edwards SM, Evans DG, Hope Q, et al; UK Genetic Prostate Cancer Study Collaborators and BAUS Section of Oncology. Prostate cancer in BRCA2 germline mutation carriers is associated with poorer prognosis. Br J Cancer. 2010;103(6):918-924. doi: 10.1038/sj.bjc.6605822. Cancer Genome Atlas Research Network. The molecular taxonomy of primary prostate cancer. Cell. 2015;163(4):1011-1025. doi: 10.1016/j.cell.2015.10.025. Fong PC, Boss DS, Yap TA, et al. Inhibition of poly(ADP-ribose) polymerase in tumors from BRCA mutation carriers. N Engl J Med. 2009;361(2):123-134. doi: 10.1056/NEJMoa0900212. Martin LP, Hamilton TC, Schilder RJ. Platinum resistance: the role of DNA repair pathways. Clin Cancer Res. 2008;14(5):1291-1295. doi: 10.1158/1078- 0432.CCR-07-2238. Abbott DW, Freeman ML, Holt JT. Double-strand break repair deficiency and radiation sensitivity in BRCA2 mutant cancer cells. J Natl Cancer Inst. 1998;90(13):978-985. Steinberger AE, Cotogno P, Ledet EM, et al. Exceptional duration of radium-223 in prostate cancer with a BRCA2 mutation. Clin Genitourin Cancer. 2017;15(1):e69-e71. doi: 10.1016/j.clgc.2016.09.001. Thompson D, Easton D; Breast Cancer Linkage Consortium. Variation in cancer risks, by mutation position, in BRCA2 mutation carriers. Am J Hum Genet. 2001;68(2):410-419. Mateo J, Hall E, Sandhu S, et al. LBA20: Antitumour activity of the PARP inhibitor olaparib in unselected sporadic castration-resistant prostate cancer (CRPC) in the TOPARP trial. Presented at: European Society for Medical Oncology Congress; September 26-30, 2014, Madrid, Spain. oncologypro.esmo.org/ Meeting-Resources/ESMO-2014/Antitumour-activity-of-the-PARP-inhibitorolaparib- in-unselected-sporadic-castration-resistant-prostate-cancer-CRPC-inthe- TOPARP-trial. Accessed February 23, 2018. Pezaro C, Omlin A, Lorente D, et al. Visceral disease in castration-resistant prostate cancer. Eur Urol. 2014;65(2):270-273. doi: 10.1016/j.eururo.2013.10.055. Robinson D, Van Allen EM, Wu YM, et al. Integrative clinical genomics of advanced prostate cancer [published correction appears in Cell. 2015;162(2):454]. Cell. 2015;161(5):1215-1228. doi: 10.1016/j.cell.2015.05.001. Edwards SM, Kote-Jarai Z, Meitz J, et al; Cancer Research UK/Bristish Prostate Group UK Familial Prostate Cancer Study Collaborators; British Association of Urological Surgeons Section of Oncology. Two percent of men with early-onset prostate cancer harbor germline mutations in the BRCA2 gene. Am J Hum Genet. 2003;72(1):1-12.